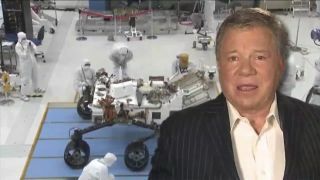 "Star Trek" actor William Shatner narrates a NASA video about the Mars rover Curiosity. How do you get people excited about a Mars rover that will attempt to land on the Red Planet in five days? You enlist the help of "Star Trek" icons Captain James T. Kirk and Wesley Crusher. Actors William Shatner and Wil Wheaton, two stars who made their mark in different installments of the hugely popular "Star Trek" television series, narrate two new NASA videos about the agency's Mars rover, Curiosity, which is scheduled to arrive at the Red Planet in less than a week. After a roughly 8.5-month journey through space, Curiosity is scheduled to touch down on the Martian surface on Aug. 5 at 10:31 p.m. PDT (1:31 a.m. EDT Aug. 6; 0531 GMT). Shatner, who played the legendary Captain Kirk in the original "Star Trek" TV series, provides the voice-over for one video, while Wheaton, who memorably portrayed the boy genius Crusher on "Star Trek: The Next Generation," narrates the other. Since their turns on the hit series, Shatner and Wheaton have become pop culture icons thanks to legions of fans around the world who affectionately nickname themselves "Trekkies." "Shatner and Wheaton are mavericks in inspiring film, TV and social media audiences about space," Bert Ulrich, NASA's multimedia liaison for film and TV collaborations, said in a statement. "NASA is thrilled to have them explain a difficult landing sequence in accessible terms that can be understood by many. Thanks to their generous support, Mars exploration will reach Tweeters, Trekkies and beyond!" In the videos, Shatner and Wheaton describe the intricate details of Curiosity's harrowing journey to the Martian surface. When Curiosity reaches Mars, the 1-ton rover will be lowered to the surface by a rocket-powered sky crane. This contraption will help slow the spacecraft's speed from about 13,200 mph (about 21,250 kilometers per hour) to zero in only seven minutes. This thrilling entry, descent and landing process is nicknamed "the seven minutes of terror" because of its complexity. Shatner and Wheaton's videos will be shared online and through social media channels, and will be broadcast at events around the country to promote Curiosity's mission and build awareness about the historic landing, NASA officials said in a statement. Interestingly, this is not the first connection between "Star Trek" and Mars. Enterprise-D, the fictional starship that was the main setting for "Star Trek: The Next Generation," was said to have been built at the Utopia Planitia Fleet Yards in orbit around Mars. NASA is planning a range of educational and public outreach events surrounding Curiosity's landing, including its first-ever multi-center social media event on Aug. 3. The event will connect six NASA centers in a simulcast with the agency's Jet Propulsion Laboratory in Pasadena, Calif. for participants to learn more about the mission and each respective NASA outpost. The gathering, called NASA Social, will be held simultaneously at six NASA centers, including the Ames Research Center in Moffett Field, Calif., the Glenn Research Center in Cleveland, the Goddard Space Flight Center in Greenbelt, Md., the Johnson Space Center in Houston, and the Langley Research Center in Hampton, Va.